Nordia Rouyn-Noranda has fun in the bubbles for a great cause! On July 15, the Nordia Rouyn-Noranda team participated for the first time to the Big Bubble Tour, the foamiest 5K fun run in town! 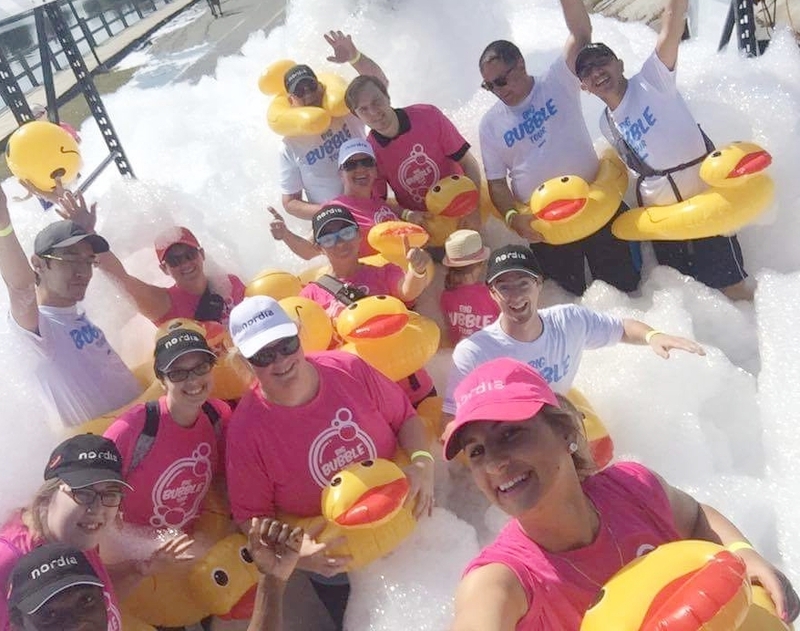 Far from being a competitive race, the Big Bubble Tour is rather a fun experience that allows the participants to blast through 5 distinct foam stations. Funds raised during the day were donated to Big Brothers Big Sisters of Rouyn-Noranda! Even though the team did not win the duck race, they had a lot of fun and is already preparing for next year's challenge! Nordia Rouyn-Noranda relays for life! On June 16, 12 members of the Nordia Rouyn-Noranda team participated in the Relay for Life in order to raise money for the Canadian Cancer Society. During this 12-hour event, walkers took turns to pay tribute to those who defeated cancer and to those who lost their fight. Nordia Rouyn-Noranda laces up to promote healthy habits! On June 4, the Nordia Rouyn-Noranda team took part in the 14th edition of Fête de la santé, who's purpose is to promote physical activity and healthy habits. Our 9 volunteers laced up bright and early for a beautiful 5K walk under the sun! Well done team! All in all, La Ressource raised over $503,158 to support its work. Many celebrities participated in the event and some even dropped by to encourage the Nordia volunteers. Thanks to everyone who worked so hard to make this event a success!